Over the past 40 million years, the suborder Notothenioidei has evolved in high latitudes of the Southern Hemisphere from generalized blennioid ancestors, producing a remarkable variety of ecological, morphological, physiological, and biochemical specializations. This diversity has led to their recognition as the only known example of a marine species swarm, rivaling the freshwater swarms of cichlid fishes in the African rift lakes and the landlocked cottoids of Lake Baikal. Over the past three decades, intensive study of the group has been driven by the increase in internationally funded research in Antarctica that followed the Antarctic Treaty of 1959. There are no unequivocal notothenioid fossils; thus, little is known of the origins of the suborder. Earlier claims of Eocene and Miocene notothenioid fossils from the Antarctic Peninsula and New Zealand have been discounted. The only substantial Antarctic fish fossils are found in Eocene deposits on Seymour Island, near the Antarctic Peninsula. These beds contain a cosmopolitan shallow-water fossil fish fauna that is completely different from the modern Antarctic fauna, presently dominated by notothenioids. As Antarctica became glaciated, the hardy notothenioids replaced the earlier fishes and then diversified under the impetus of habitat destruction associated with cyclical glacial advances. Notothenioids have a diversity of sizes and body forms. Most are small fishes, on the order of 1 ft (30 cm) in length, but some species may be as small as 4.3 in (11 cm) or as long as 6 ft (1.8 m). None is highly colored; most have black, brown, or gray mottling on paler backgrounds. They have two to three lateral lines on the trunk and well-developed sensory canals on the head, jaw, and pre-operculum. Three platelike radials characterize the pectoral girdle. 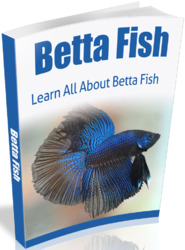 All notothenioids lack a swim bladder. Many of the 96 species of Antarctic notothenioids coexist with sea ice, near the freezing point of seawater (28.6°F, or — 1.87°C). They are protected from freezing by an antifreeze glycopeptide (AFGP), consisting of repeating groups of three amino acids (-alanine-alanine-threonine-) n, with a disaccha-ride (galactose-N-acetylgalactosamine) attached to each threonine. AFGP works differently from normal colligative antifreezes such as salt or glycol, which only depend on the number of ions or molecules to lower freezing temperature. Instead, AFGP molecules bind to mircroscopic ice crystals and interfere with the attachement of additional water molecules, preventing ice from growing to a size that would damage living cells. Thus a very small number of AFPG molecules can have a disproportionate effect on freezing. The gene encoding AFGP has evolved from part of a gene for the digestive enzyme trypsin. As well as being important for survival, AFGPs are meta-bolically expensive. In the high-latitude notothenioids that produce AFGPs, changes in the kidney reduce their loss. Instead of forming urine by pressure filtration in capillary bundles (glomeruli), Antarctic notothenioids eliminate wastes by selective secretion into the urine, and AFGPs are retained. Their kidneys lack the glomeruli characteristic of most other vertebrates. In contrast, the 26 species of notothenioids living outside Antarctic waters rarely encounter freezing seawa-ter, lack AFGPs, and have glomeruli. • Bovichtidae: These are found mainly north of the Antarctic convergence, in Australia/Tasmania, southern New Zealand, and southern South America. One species occurs along the Antarctic Peninsula. • Pseudaphritidae: The family inhabits streams and estuaries of southeastern Australia and Tasmania. • Eleginopidae: These fishes are confined to southern South America. • Harpagiferidae: The family is found mainly in sub-Antarctic regions, from Patagonia, the Falkland Islands, South Georgia, and the Scotia Arc to the tip of the Antarctic Peninsula and in Kerguelen, Crozet, and Heard Islands. • Artedidraconidae: These fishes are exclusively Antarctic, from South Georgia along the Scotia Arc to the Antarctic Peninsula and around continental Antarctica. • Nototheniidae: Thirty-four species are truly Antarctic, and the remainder occur in sub-Antarctica, Patagonia, and southern New Zealand. • Bathydraconidae: The family occurs in the Antarctic, from South Georgia along the Scotia Arc and around the Antarctic continent. Falkland Islands. The other 14 species are found from South Georgia through the Scotia Arc and around the Antarctic continent; they also occur in the Bouvet and Kerguelen Islands but not as far as the Heard, Campbell, or Auckland Islands. Notothenioids are widespread in coastal waters of the Southern Ocean, on or over the continental shelf. Their depth range is from the surface to 1,370 fathoms (2,500 m). Aside from their dispersive larval stages, most avoid the open ocean, living on or near the bottom as adults. Several species of No-totheniidae and Channichthyidae have abandoned their ancestral benthic existence, however, to move up into the water column, becoming pelagic. Lacking swim bladders, these mid-water forms have increased buoyancy in other ways. Their bones are less mineralized than those of demersal species, and they have high oil contents. One widespread pelagic species, the sardine-like nototheniid Pleuragramma antarcticum, retains larval features, including a persistent notochord surrounded by greatly reduced vertebral centra. Notothenioids tend to be sedentary bottom species that swim infrequently. Where swimming has been observed, it is labriform, propelled by undulatory sculling of the pectoral fins. The trunk and tail are used only for short, fast dashes. Even the pelagic forms are relatively inactive. Demersal notothenioids are generalized predators. Some forage nonselectively; others are ambush predators. Pelagic species, such as P. antarcticum, are more selective, feeding on copepods, larger midwater crustacea (e.g., krill, such as Eu-phausia superba), and pteropods (e.g., Limacina). In turn, these smaller midwater fishes are eaten, along with krill and squid, by the few large mesopelagic fish (such as the toothfish, Dis-sostichus mawsoni), by birds (penguins, skuas, and petrels), and seals. D. mawsoni is eaten by Weddell seals (Leptonychotes wed-delli) and by killer whales (Orcinus orca). Many Antarctic and subantarctic notothenioids breed biennially, with oocytes taking two years to ripen. Eggs are large and yolky and usually are spawned on or near the bottom. Spawning times differ with latitude and between species, ranging from early spring to early winter. 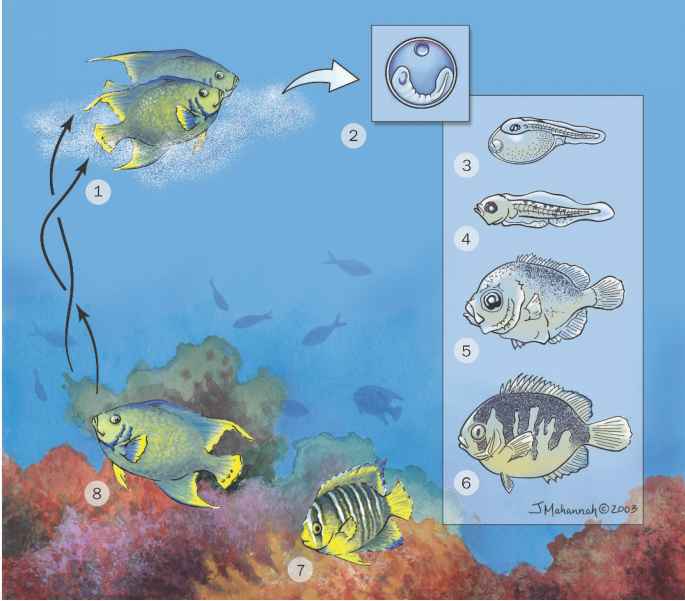 Embryonic development and growth are slow, and most larvae hatch 6-12 months after spawning. The larval stages are pelagic, settling to the bottom after feeding in the plankton for six to nine months. None of the notothenoids are on the IUCN Red List. Although the majority of notothenioids are not exploited and have widespread and abundant populations, several species have been the target of fisheries. 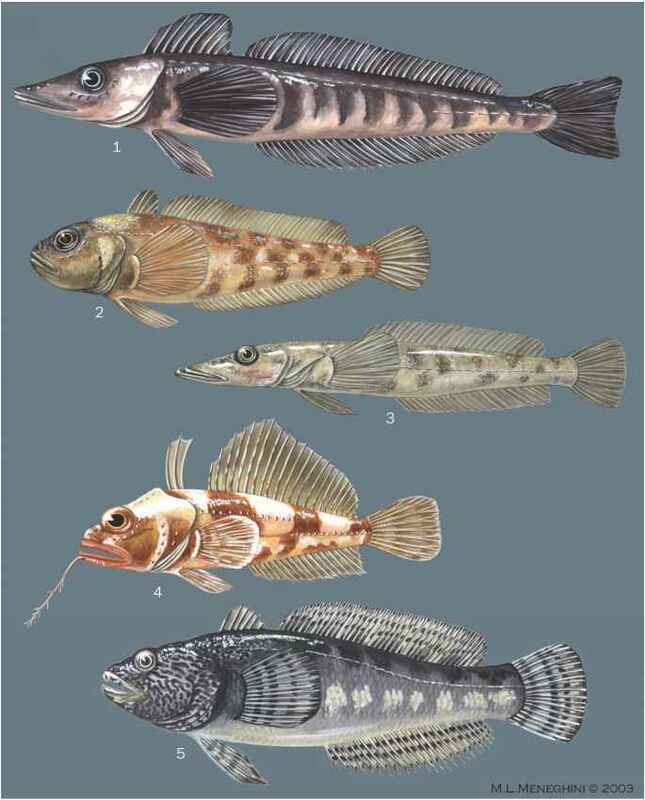 The marbled rockcod, Notothenia rossii, has been seriously overfished but is no longer targeted, and it is recovering, albeit slowly. The Patagonian toothfish, Dissos-tichus eleginoides, has been exploited since the 1980s and has been given the designation of data deficient in a report on the conservation status of Australian fishes complied by the Threatened Fishes Committee of the Australian Society for Fish Biology. After depleting the South Georgia/Falkland Islands tooth-fish fishery, attention shifted to Macquarie and Kerguelen Islands and then further west, to the southern Indian Ocean. In the mid-1990s the estimated illegal catch exceeded the legal catch, but in 1999 the Commission for the Conservation of Antarctic Marine Resources implemented a strict catch-reporting regime for toothfish, reducing the 1999/2000 illegal catch to an estimated 8,418 tons (7,637 tonnes), of a to tal 33,660 tons (30,536 tonnes). Since 1996 there has been a limited exploratory fishery for the closely related Antarctic toothfish, D. mawsoni, in the Ross Sea, where a catch of 1,000 tons (907 tonnes) was reported in 2001. Because most no-tothenioids share characteristics of low fecundity and slow growth, their fisheries are highly susceptible to overfishing and should be monitored closely. Some notothenioids have been harvested for fish meal and oil (e.g., P. antarcticum), but the group is exploited mainly for human consumption. 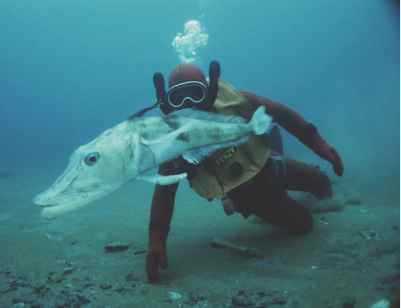 The mackerel icefish, Champsocephalus gunnari, is the basis of small, but sustainable fisheries near South Georgia and the Kerguelen Islands. There is a ready market for the two toothfish species, D. eleginoides and D. mawsoni, which are highly palatable.